Roninspoon - The travels of Li Xiuyuan and reflections on excuses. The travels of Li Xiuyuan and reflections on excuses. The monk was last seen walking north, with the intent of visiting Moscow. His reasons were his own, and he would only offer a small smile when asked what he would do when he got there. And that’s why I didn’t update last week. Because of a mysterious old Monk traveling into Tsarist Russia at the end of the 17th century. No, really. It’s all true. Three heads, none of them historical Chinese monks. Seth is still banging away at the pages for Infestation, and I’m still neck deep in cardboard boxes, although more and more of them are empty, as opposed to full. Last week my house looked like the final scene of Raiders of the Lost Ark. Now it just looks cluttered and disorganized. Until Seth is ready, we’ll just keep running with these preliminary sketches. 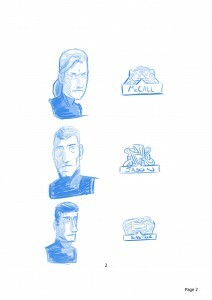 Today we have some conceptual head shots of some of the main characters.